Seeds for Change is a grass roots community organization that has partnered with the York Region Food Network to create healthier neighborhoods through establishment of school and community gardens. Joan Stonehocker, Director at the York Region Food Network, is filling in for Lynne Koss this evening, who was called out of town, unexpectedly. 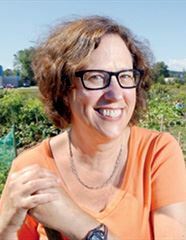 Lynne Koss is passionate about addressing the worldwide social issue of access to healthy food. She and her daughter have been making a positive impact on the lives of others in this manner for the last ten years.